Fortunately, through a friend of a friend, I was able to sit down and have a conversation, albeit over the phone, with a woman who is doing exactly that. Jen K. Reilly lives on a boat, with her husband and three boys, aged 18, 16, and 13. As a girl, Jen knew she wanted to learn to sail after just one sailing experience with a friend and her dad; and, after spending time as a teenager traveling on a boat with his parents, Jen’s husband was more than agreeable to doing it again. As young parents, they saved and planned, until the time was finally right – this past June – to purchase a boat and invite their children to sail with them for a year. They started in Florida and went up to Maine and have been making their way south since September. When their year’s journey is over, their oldest son will start college. Contrary to what it might sound like, life on the sea is not a “grand vacation,” says Jen. There are chores, the younger two boys are still doing schoolwork, and there’s daily maintenance to keep up with the needs of the vessel they rely on. “On land, things come easily,” says Jen, “You flip a switch and get electricity.” Living on a boat is a lesson in self-reliance. They fill their days with meeting their needs – cooking, cleaning, docking on land to buy a month’s worth of groceries—and at night, they take turns, in 4 hour shifts, watching. This time, when she “might not see a single other boat” is when Jen stops to say, “Wow.” Being alone—truly alone—reminds her of how big the ocean actually is. Even more astounding is that their life away from land works. “Being so far from everything and still being able to make things work,” says Jen, is what self-reliance has come to mean to them. There’s no convenience, no take-out menus. You have to know how to do what you need to have done. Or, you have to be willing to learn. Jen speaks of the learning curve in radio lexicon as being a fun challenge when they first started out. She also told me of how they learned not to catch more fish than they were going to eat right away. And that catfish are harder to kill than other fish. Now there’s something you don’t learn at the local market! In fact, one of the greatest wonders for Jen has been teaching her children to take care of their own needs and then observing them doing just that. There’s a certain satisfaction in knowing how to keep yourself “alive, safe, and happy,” says Jen. “From being able to figure things out.” Her boys have learned everything from the mechanics of the boat to repairing sails and making their own water. Despite having to take care of their own daily needs and plan ahead for the months to come when they do make a stop, there is still more time for reflection on the boat than there was in their ‘on-land’ life, a fact that made Jen realize they had been choosing “busyness and craziness.” And that they could make another choice. 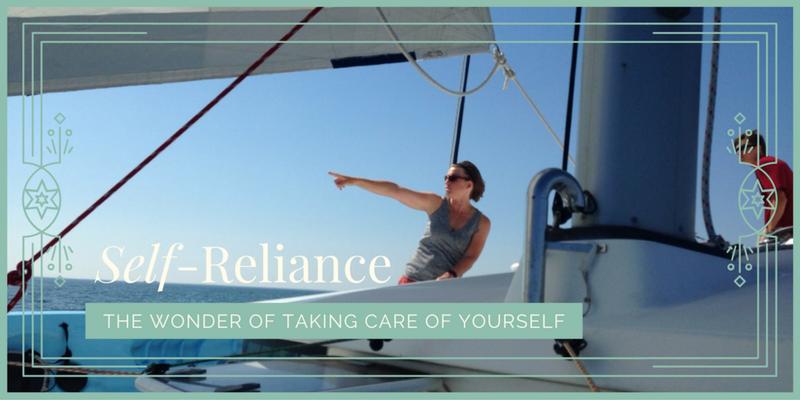 Learning on the go and being self-reliant are values Jen says they’ll continue to hone so that they can take these values with them when they return home. Most of us will not get a chance to spend our life doing something totally unconventional (though I’ve had my eye on a trip around the country in an RV for quite some time! ), but we can still make the choice to invite ease, reflection, and self-reliance into our day to day existence. For those of you dreaming of the day when you can take off around the world…Jen’s advice is to start with a realistic goal. Plan an immersive experience, even if it’s just for a week or a day. Push yourself to doing something that isn’t easy, something that intimidates you. Ask for help when you need it, but learn to plan ahead so you’ll be ready for what’s to come. The next time you want to do something out of your comfort zone, says Jen, being self-reliant will be "that much easier." Jen K. Reilly is a teacher who's currently traveling the ocean with her family of 5. Follow their journey at Living the Life of Reilly.com. Connect with Jen on Facebook @jkreilly. January Playlist: "The Story of You"